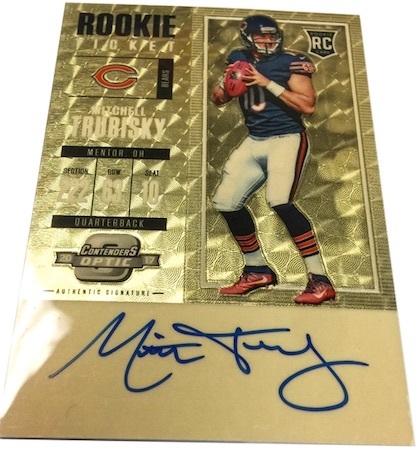 Imagine Rookie Ticket autographs flooded with chromium and you might have 2017 Panini Contenders Optic Football. 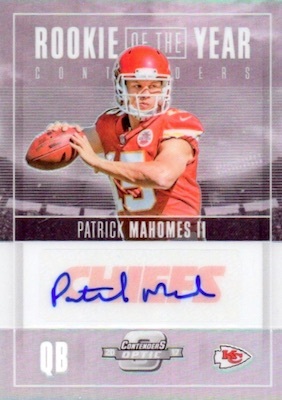 The new NFL brand combines the popular signed rookie cards and a shiny finish to deliver two autographs per hobby box, with at least one being hard-signed. 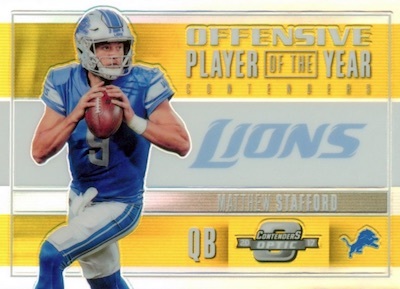 Using the designs from 2017 Contenders, and applying the technology from 2017 Donruss Optic, 2017 Contenders Optic NFL shrinks the format to just one pack of six cards per box. Despite the very limited box yield, there is still a full base lineup with the Season Ticket set. Base cards come two per box, and there are also numbered Red, Blue, Gold and Gold Vinyl parallels. 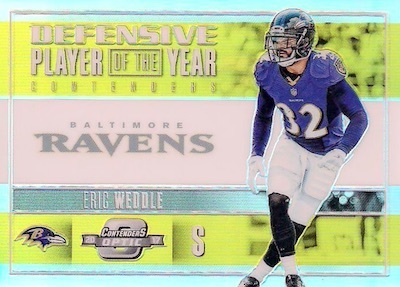 Parallels combine to average one per box. 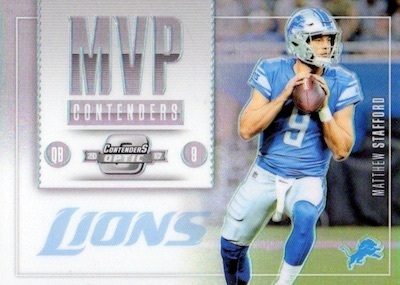 Filling the ranks, inserts drop two per box, and include All-Pro Contenders, Hall of Fame Contenders, MVP Contenders and Round Numbers. 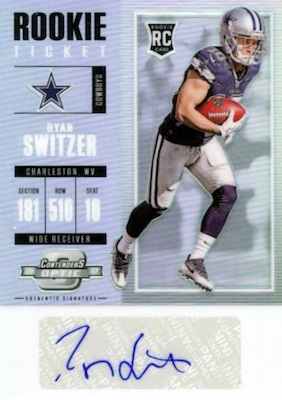 Signatures naturally dominate focus in the one-pack boxes, and the 2017 Panini Contenders Optic Football checklist is led by the Rookie Ticket RPS Autographs. 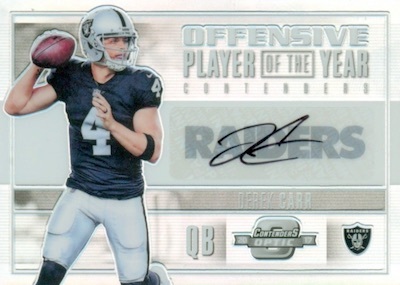 These Opti-Chrome cards are signed on-card and fall one per box, on average. There are also Gold and Gold Vinyl (1/1) parallels. 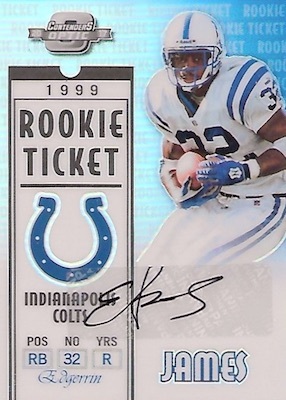 Celebrating Rookie Ticket designs of the past, the Contenders Tribute autograph set reimagines prior first-year classics, including options from 1998, 1999, 2000 and 2001. These limited cards are numbered to 25 or less. 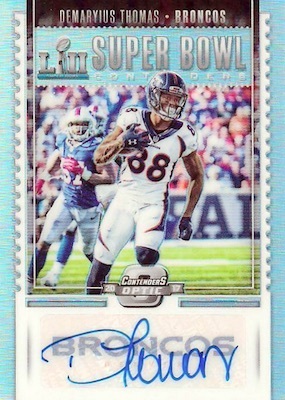 Other signed cards to chase include Hall of Fame Contenders, for those likely to enter Canton sooner than later, and Rookie of the Year Contenders (#/99 or less), which identifies the strongest ROY candidates. 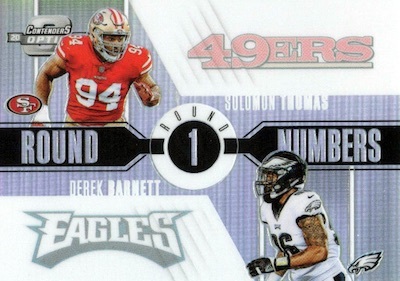 Matching top names from the 2017 NFL Draft are Round Numbers autographs. PARALLEL CARDS: Red #/199, Blue #/99, Gold #/10, Gold Vinyl 1/1, Printing Plates 1/1. 39 cards. Shop autographs on eBay. PARALLEL CARDS: Red #/75 (Dobbs/Godwin #/50*), Blue #/25 (No McNichols*), Gold #/10, Gold Vinyl 1/1, Printing Plates 1/1. JOE WILLIAMS/JOSH REYNOLDS PARALLELS**: Red #/25, Blue #/10, Gold #/5, Gold Vinyl 1/1, Printing Plates 1/1. 59 cards. Shop autographs on eBay. PARALLEL CARDS: Red #/75, Blue #/25, Gold #/10, Gold Vinyl 1/1, Printing Plates 1/1. TRENT TAYLOR PARALLELS: Red #/15, Blue #/10, Gold #/5, Gold Vinyl 1/1. PARALLEL CARDS: Gold Vinyl 1/1. PARALLEL CARDS: Red #/49, Blue #/25, Gold #/10, Gold Vinyl 1/1. 15 cards. Serial numbered #/49. PARALLEL CARDS: Red #/25, Blue #/10, Gold #/5, Gold Vinyl 1/1. 30 cards. Serial numbered #/75. 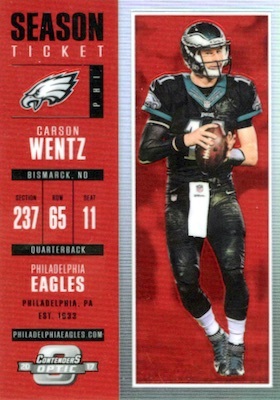 View the 2017 Panini Contenders Optic Football checklist spreadsheet. Are the backs going to be in horrible of shape like base contenders? Nothing like pulling a superbowl ticket with edges and corners that look like my three year old has been handling all day long. 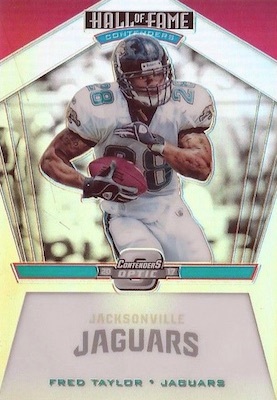 Who knows what to expect, I trust Panini will bring something NEW and different to the card community. Based on the examples above I am optimistic. Our facebook group is busting a case in March! Just hope sticker autos are at a minimum and there are ALOT of JUJU variations! I’m fired up. I love the concept. Once the product hits I’m sure the massive amount of buyers will drive up the cost to buy singles. Condition is a concern. However, I’m buying! 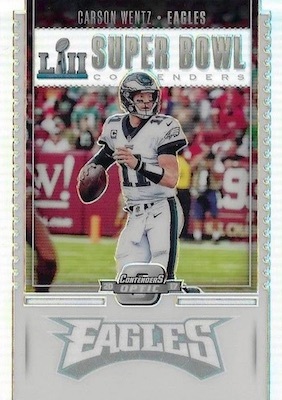 the inserts for MVP, Offensive and Super Bowl Contenders have Tom Brady in the set..
all those in favor???? reply with a GOAT chant..
this stuff looks pretty amazing i ordered 6 boxes when it was still $94 now its about $150. giving the optic look to contenders was a pretty nice idea..you take a kinda average design like contenders and spice it up a bit. No Zay Jones RPS auto? Watched a case break and it had 3 POINTS CARDS (250) in the break! What trash. We’ve asked Panini to stop with the bad points cards and they dont care, if it works for them financially they dont listen to the collector. Product looks nice when the cards hit, but 900 points in each innner for a total of 1800 points in a case? That’s a joke wouldn’t recommend this product save your money for National Treasures hopefully Panini wont ruin that one. The Gold Vinyl 1/1 parallels and 1/1 autographs will be some of the best chase cards in the hobby this year. The only downside is that some cases have a lot of points cards. This is a great case break product but not so great for individual personal boxes. If you do hit a Gold Vinyl Deshaun Watson or Tom Brady you may be able to name your price on it. Happy treasure hunting! 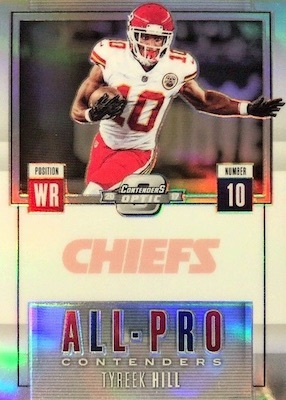 I’m not a huge fan of this product but tonight, the guy I buy spots in breaks with from time to time, pulled probably the biggest card in the set. 1 of the Peyton Manning Rookie ticket Autos. It looked amazing. Same Contenders low-mid range product with a shiny coating. $120 for 6 Cards is beyond crazy. 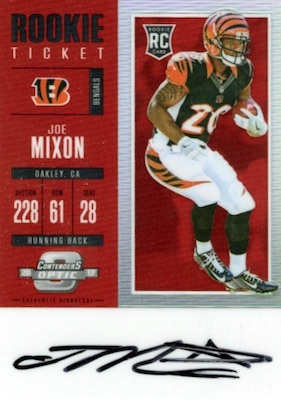 I believe I have found a misprint but omission would be a better description. 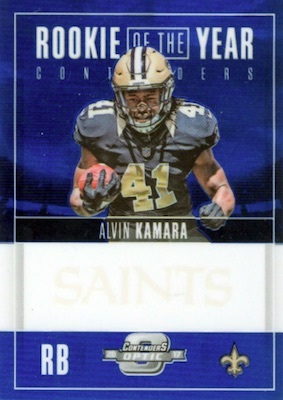 All variations of the Kenny Golladay RC Autos that I have or have seen on Ebay are missing DET in the white box next to the Lions logo on the rear of the card. After carefully examining the rest of the set I noticed that this card is the only instance of this happening. Maybe this is worth mentioning, maybe not, but I thought someone should be made aware.